On 23rd April 2015 give a book on World Book Night. World Book Night is an annual celebration of books and reading where volunteers and give a book to members of their communities who do not have access to books. Anyone can volunteer to give a book, it can be a new or a well loved book that you already own. To find out more click this link for details. 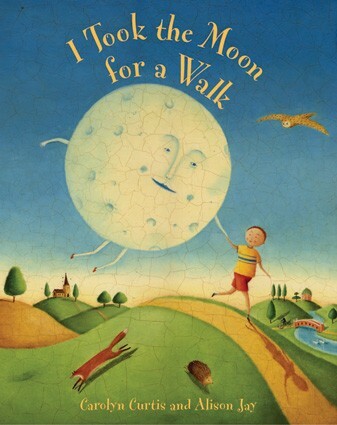 We’ll be donating a number of paper back titles on the night, including this particular favourite of mine “I took the Moon for a Walk” by Carolyn Curtis and Alison Jay. Who are you going to share a book with on World Book Night? Stuck for ideas? Why not gift a book from our collection, click here to browse. World Book Night Update 9/6/2015 – We were really pleased to donate books to two organisations in the London Borough of Newham. The first, Ingeenium is a small creativity charity based in Custom House that provides, accessible creative projects for people in London. The second was Little Diamonds Nursery Ltd based in Forest Gate, which provides childcare aged 0 – 5 years. Thank you so much for sharing the light of literacy by donating copies of I Took the Moon for a Walk and other books on World Book Night!